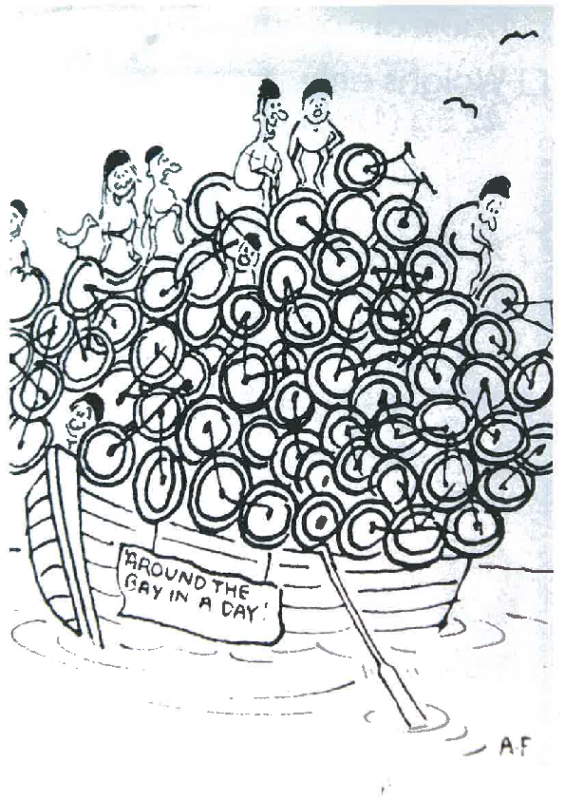 In 1993, Bicycle Victoria (as Bicycle Network was then known) decided to test out the demand for an ambitious new event that would hopefully attract about 500 riders. The route would take the Westgate Bridge from Port Melbourne, continue through Geelong to Queenscliff, cross the water by ferry to Sorrento, and then back up to Melbourne again via Beach Road. The date was set for Sunday 17 October 1993. The interest from riders was immediate and immense, with thousands wanting to take part. A change in plans was necessary, as there were not enough ferries to cater for all entrants. Organisers decided to split riders up, with one half doing the route as originally proposed, the other starting in the opposite direction and heading for Sorrento first, crossing by ferry to Queenscliff, then riding back up to Melbourne. There were eventually 2,700 riders entered, with another 1,000 knocked back due to lack of ferry capacity. With 100 volunteers lending vital support, the first Around the Bay in a Day got underway at 5.30am from JL Murphy Reserve in Port Melbourne, and despite the long distance and hard riding involved, with many riders finishing in the dark, it was deemed an overwhelming success. Melbourne was amazed at the success of the event and The Age newspaper ran a front page photo the following morning highlighting the positive response. Knowing what to expect in 1994, Bicycle Victoria entered a partnership with The Smith Family charity. With the addition of a new ferry, the Peninsula Princess, capacity increased to 3,000 riders. The event quickly sold out again, and hundreds were turned away. Training seminars to help riders began, and were immediately popular, and teams signed on to compete for the inaugural The Smith Family Corporate Trophy. Known as Operation Dunkirk, there was a big squeeze on some of the smaller ferries, where pedals had to be removed to make room for all the bikes. One distracted rider reportedly popped his pedals into his helmet, and subsequently when swinging his lid about, accidentally flung the pedals into the sea. By 2001 the ride had grown even further, and a record 5,000 riders took part. After securing another ferry in 2002, that number increased to 7,000 participants. The event start and finish location was relocated from Port Melbourne to Catani Gardens in St Kilda that year, and 272 teams participated. The ride even became an international event, a 43-strong Irish team came over especially, as did others from Singapore, New Zealand and the USA. From 2007, a partnership with the City of Melbourne began, with the event start–finish site moving to Alexandra Gardens. Joining forces with the GO Bike Expo, Around the Bay in a Day became part of the Melbourne Cycling Festival, involving a whole weekend’s activities at the Gardens Precinct in Melbourne. This year’s ride was also the hottest on record, with temperatures reaching 38 degrees and hot northerly winds making for some very unpleasant conditions. 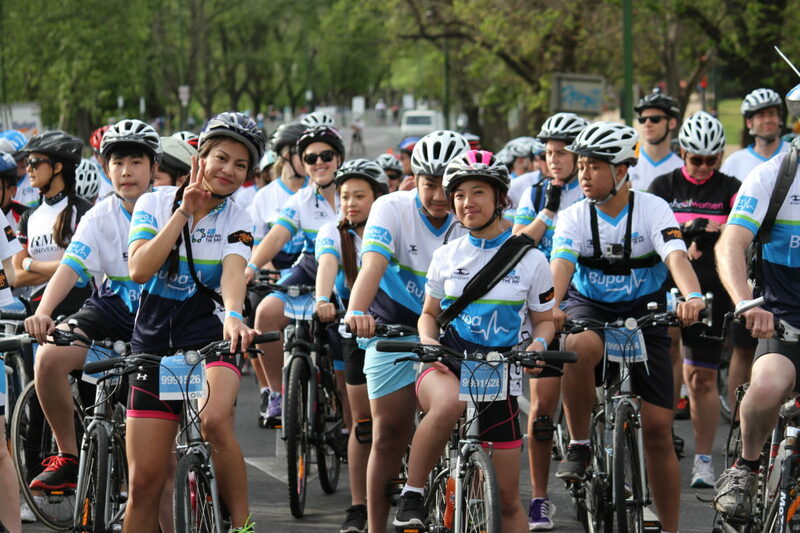 In 2009, as part of the Melbourne Cycling Festival, 15,609 riders took part with a record 525 volunteers assisting. In this year $1,000,000 was raised for The Smith Family for the first time. For 2010 the day was wet and one of the ferries was cancelled the night before, but this didn’t deter over 16,000 riders from taking part, which was a new record for participation. 2012 was the ride’s 20th edition and since then has consistently catered for more than 10,000 riders every year, including 2016 when strong winds pushed riders and challenged 2003 as the most difficult ride to date. Around the bay riders at the start line in 2014. The weather increased the challenge for the 2003 running. Riders were caught out by a very warm morning start, broken at 7am by a torrential downpour and a drastic drop in temperature. Riders sheltered under bridges before continuing sodden to the ferries to wait shivering for a reprieve from the rain and cold wind. By 3pm the sun had returned and riders were warmed and mostly dried out, but this year remains the most dramatic for the weather. By 2005, Around the Bay jerseys of different vintages were a common sight on riders around Melbourne. It seemed that every bike rider was either an Around the Bay veteran or training for their first circuit. This year the ride hosted over 10,000 riders for the first time. For 2006, the event offered four ride distances for the first time: 42km, 100km, 210km and 250km. More than 14,000 riders rolled out, helped on their way by over 400 volunteers. The 250km distance was named The Legend, and it proved a hit with the riders. 2017 was the 25th edition of Around the Bay and a large bike riding party marked the occasion. Every rider was also given a commemorative ‘confetti’ jersey, a change from previous years when different jerseys were designed for longer and shorter routes. Having 10,000 riders set off all in the same jersey was a magnificent sight. In 2018, the event gained a new name, a new start site and a new distance. Energy provider United Energy came on board in a major event partnership and the start line and event village moved to Albert Park, a place that is synonymous with Melbourne and more comfortable for riders. A 300km ride option was also debuted, becoming the longest and toughest ride in the event’s history. Over more than 25 years of this great ride one thing has become clear – it is a rite of passage that brings every kind of bike rider together. It is a fun challenge for everyone, whether you’re a beginner rider or seasoned cyclist, and while sometimes the weather is a factor, it’s never a detractor. If you’re never ridden the event or even think you’ve outgrown it, this is the year to take on United Energy Around the Bay. There are now 9 ride options ranging from 20 kilometres to 300 kilometres, making it easier than ever to ride your way. 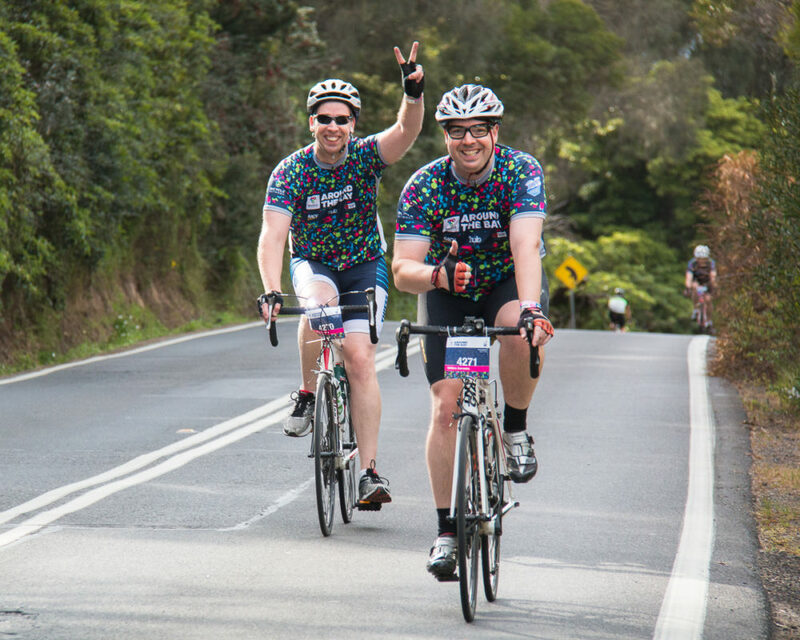 The United Energy Around the Bay legends have ridden in every event since its inception in 1993 and have seen the ride grow from a local cycle to a major Melbourne event. Geooff says it was “a moment of complete insanity” that got him to enter the first event. United Energy Around the Bay satisfied his need for a challenge that would improve his cycling, but didn’t exactly know what he was in for and all his friends and family thought he was nuts. His memories from 1993 are of a small event staged at Melbourne’s old Docklands site with about 1,500 riders. The familiar sights and smells of the last leg of the journey along Beach Road and huge sense of achievement still sticks with Geoff. Since that first year, Geoff says he has seen United Energy Around the Bay grow into an event that now draws riders from all over Victoria, and even interstate and overseas. He also acknowledges the thousands of riders that keep coming back to keep fit and enjoy bike riding and that without then, United Energy Around the Bay could have faded out long ago. Geoff’s tip: simply enjoy the day: take in the scenery, talk to other riders out on the road and give it your best effort. Brian was drawn to the first United Energy Around the Bay in 1993 as a challenging, long distance ride that wasn’t a race. While going in somewhat under prepared with little idea about properly hydrating for a 200km plus ride, Brian was bitten by the United Energy Around the Bay bug and he keeps coming back to enjoy the comradery with other riders, and keep his fitness up. A number of memories stick out for Brian over the years – being overtaken by a five-person tandem bike, the Premier of Victoria passing in the slipstream of a moto-marshal, crossing the bay in a fishing boat during the early years and cruising down the coast with a nice tail wind. Brian’s tip: be prepared, train the same way you will ride on the day, and of course, pay attention to hydration. Winston had been riding for less than a year when his friend and mentor Kevin Lee (also an United Energy Around the Bay legend) convinced him to have a go at this new ride coming up. Part of a group of riders from Daylesford, Winston finished the 210km clockwise route at exactly 3:55pm. They then had to pick up a friend at the airport on the way home, where Winston took great glee in telling anyone in earshot he had just finished 210 kilometre bike ride. His second United Energy Around the Bay in 1994 didn’t go so well, when cramps struck on a hot October day and Winston finished rolled across the finish line about 7:00pm. After those first two rides his goal was to complete United Energy Around the Bay 10 times, and here we are 25 years later. His sister and brother-in-law have joined in several times and Winston takes delight in introducing new riders to the event and seeing them achieve something special and complete the ride. Winston’s tip: if taking on one of the larger distances, make sure you have done at least one 100 kilometre ride beforehand. Trevor entered United Energy Around the Bay after his Bayside bike riding group had completed circuits of Port Phillip Bay. 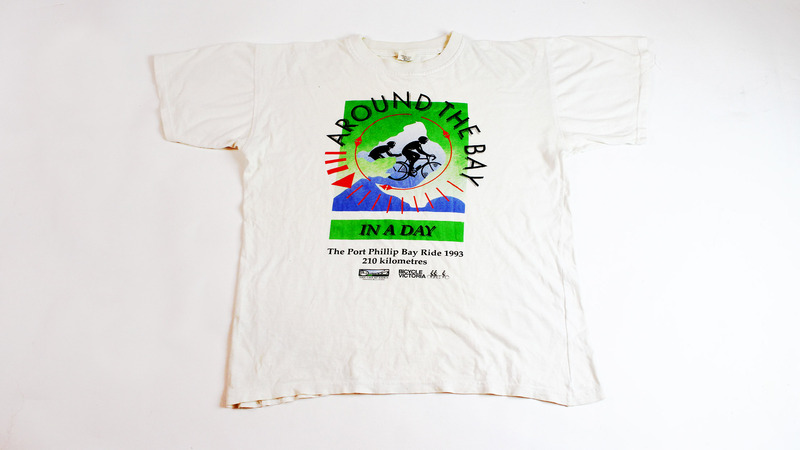 He says that back in the early 1990s other people were astounded that you could ride a bike Around the Bay in a day, but that the event helped change people’s perception and the event became a mass ride that could challenge both novice and experienced riders. Trevor was glad the event became an annual spring event – it gives you something to aim for while training through the tough winter months, and of course it is after the football season. His favourite part of the ride is when the bayside breeze picks you up and gives you a little kick along the route. He says it picks up just past Geelong, where a south-westerly carries you through to the Queenscliff ferry where you can share a few war stories with other riders. Once you get onto Beach Road, the tail wind comes on and you’re on the familiar run home at speed. Trevor’s tip: practice your group riding skills and have the right bike and clothing. Philip had only done a couple of 100 kilometre rides before United Energy Around the Bay in 1993, and not along Beach Road either. He thought that finishing a 210 kilometre ride around Port Phillip Bay to be quite an achievement. While riders are well equipped to tackle United Energy Around the Bay with cycling clothes, or at least shorts, a t-shirt and proper shoes, Phillip recalls this wasn’t always the way. On the first ride in 1993 he remembers passing a rider on a mountain bike who was wearing jeans and thongs. While this must have bene uncomfortable, Philip did see him at the finish line later in the day. Philip keeps coming back every year to United Energy Around the Bay with friends and colleagues and loves catching up with the other legends, as well as the challenge of completing a lap of the bay – no matter how tough it may be. In the mid 2000s Philip remembers a ride in pouring rain where the temperature dropped to about six degrees in Geelong. The cold set in on the ferry and Philip, numb and shivering but determined not to pull the pin, spent an hour with event volunteers having soup and coffee in a caravan. Eventually the sun came out, his colleagues arrived and he was able to push on and finish the ride. Philip’s tip: be prepared for any type of weather. It is Melbourne, so expect anything from searing sun to rain and wind. We’d like to acknowledge the amazing achievement of the following riders who have completed more than 15 United Energy Around the Bay rides. Please note: If we missed your name, let us know and we’ll make sure it’s added.